Defenseman Aaron Ekblad reached a second important milestone in his NHL?journey Wednesday when he signed a three-year, entry-level contract with the Florida Panthers. Now comes the next, and perhaps most challenging, step:?making the Panthers' opening-night roster. • Ekblad was named the Ontario Hockey League's Most Outstanding Defenseman in 2013-14, leading his position with 23 goals and finishing tied for fifth with 53 points. He became the third player in his 18-year-old birth year to win the honor in the past 20 years, following Ryan Ellis (selected 11th by the Nashville Predators in 2009) of the Windsor Spitfires in 2009 and Bryan Berard (selected 1st by the Ottawa Senators in 1995) of the Detroit Jr. Red Wings in 1995. • Named captain prior to the 2013-14 season, Ekblad led Barrie to a second-place finish in the Central Division and added two goals and four assists in nine playoff games. The Colts were eliminated in the second round by the North Bay Battalion. • He played a top-four role as a 17-year-old on the Canada defense at the 2014 World Junior Championship, with a goal and an assist in seven games. Ekblad has shown leadership on the international stage, as captain of Canada when it won the 2013 Under-18 Ivan Hlinka Memorial gold medal and serving as captain of Team Ontario at the 2013 World Under-17 Hockey Challenge. • Ekblad was granted exceptional player status by Hockey Canada to be eligible for the 2011 OHL Priority Selection as a 15-year-old. He was the second player in OHL history to be given exceptional player status, following John Tavares in 2005. In his rookie season with Barrie, he had 10 goals and 19 assists in 63 games to win OHL Rookie of the Year. He was named to the OHL All-Rookie Team. • A big-game performer, Ekblad finished with seven goals, 10 assists and a plus-11 rating in 22 playoff games in 2012-13, helping Barrie finish first in the Central Division and reach the OHL Final against London. 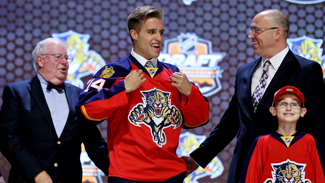 "I consider it as a set of milestones leading up to my first NHL season," Ekblad said. "Obviously the draft was a big one, this is a big one, and coming into camp next week is going to be a big one as well. I'm pretty excited. It's a pretty cool experience for sure." Ekblad, the No. 1 pick in the 2014 NHL Draft, is hoping to join a young Panthers defense that has two players older than 24, Brian Campbell (35) and free-agent acquisition Willie Mitchell (37). Ekblad, 18, said he's very confident?? ?he can earn a spot in a group that figures to include 2009 first-round pick Dmitry Kulikov (23) and 2010 No. 3 pick Erik Gudbranson (22). "If you don't believe in yourself you're putting yourself behind the eight-ball,"?? ?Ekblad said. "I do believe in myself. I believe I can be on this team opening night. I'm very confident in that. I feel like I'm ready. I couldn't be in a better position than where I am." Ekblad was named the best defenseman in the Ontario Hockey League last season after leading the league's defenders with 23 goals and tying for fifth with 53 points. He had one goal and one assist for Canada at the 2014 IIHF World Junior Championship. Ekblad was the captain of his junior team, the Barrie Colts, and Canada at the 2013 Ivan Hlinka Memorial Cup. He sustained a concussion Aug. 5 at Canada world junior evaluation camp. "I actually thought, 'You know what, this feeling will go away in a couple of days,' and one of the doctors was like, 'Yeah, probably in about 7-14 days,'" Ekblad said. "I thought that was almost ridiculous because I've never really had that kind of injury before. However, I feel great now. I'm ready to go. I've had a couple of good weeks of training under my belt and I think that's really helped me put things into perspective. I know I have a lot of hard work to get to to make the team, but I feel ready to go and my head definitely will not set me back." Ekblad will arrive in South Florida next week for the start of rookie camp before the Panthers fly to a rookie tournament involving the Nashville Predators, Tampa Bay Lightning and Boston Bruins. Ekblad said Wednesday he hasn't had any setbacks, and Panthers general manager???????? ?Dale Tallon said there was a chance the defenseman could play in the rookie tournament at Nashville. "We'll take our time,"???????? ?Tallon said. "We'll be careful. He seems to be 100 percent. We'll see how it goes the first few days of camp. If he's ready and willing and healthy, we'll let him go. But we'll be careful." The bigger focus for Tallon and Ekblad is the regular season and a spot on the Panthers roster. "We're very hopeful,"???????? ?Tallon said. "I think he can (make the roster). He's big and strong enough and he's got the ability, so it's a matter of adjusting to the pace. It's a different pace. Going from juniors to the NHL???????? ?is a big step, especially on the back end." Ekblad (6-foot-4, 216 pounds) said he's keeping an even-keeled approach heading into his first NHL???????? ?training camp. "I'm very calm and collected with how I feel about most things,"???????? ?he said. "I'm very excited and I couldn't be happier to be put in this position. I know Florida is going to have a good team next year and in the upcoming years. I'm excited to be part of that process and to help turn things around there. "I think I just need to come in and prove my work ethic and my ability to play against men. Obviously it's not an easy league. It's fast-paced. It's hard-hitting. And it's smart. It's an intelligent game and only intelligent players can play in this league. I just need to prove all of those things and prove I've been working hard enough to put myself in a spot on the Florida Panthers next season."